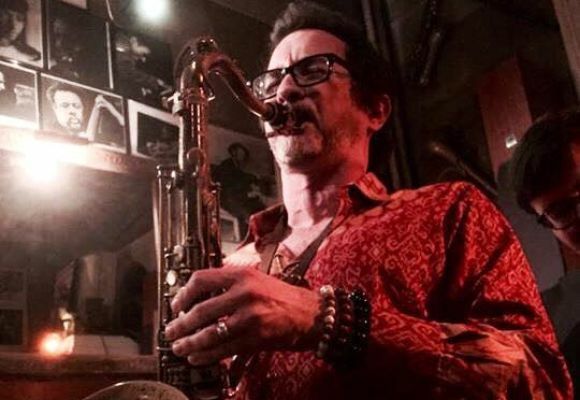 Sean Nowell is a tenor saxophonist and composer from Birmingham, Alabama steeped in the southern traditions of blues, gospel, jazz, and funk fused with the complex harmonic and world rhythmic concepts that permeate the music of New York City. While in Alabama, he sang in cathedrals with a national touring a cappella choir and was exposed to vocal music from Germany, Eastern Europe, and Africa. He received a BA in Composition from Berklee College of Music in Boston in Jazz Composition and a MA from Manhattan School of Music in New York in Performance. He has composed and improvised film scores, music for ballet and theatre, 20th century classical music, big band, and small jazz ensembles and has pushed the timbral boundaries of the saxophone by integrating electronic effects pedals. He has traveled and collaborated with dancers, actors, painters, stilt walkers, and acrobats on multiple tours of China, Bulgaria, Kosovo, Macedonia, Bosnia, Serbia, Romania, France, Germany, Hungary, Holland, Belgium, Colombia, Venezuela, Singapore and the United States as Musical Director for Bond Street Theatre over the past decade. Hes participated in uniting clashing religious and ethnic groups through music in Kosovo and is been proud to have served as an Official Artistic Ambassador for the US State Department in Turkey. By exchanging social and artistic ideas with local artists and holding master classes in these countries on American Jazz, by learning the folk music of the regions, and then by incorporating the authentic experience into his compositional and improvisational style, Sean Nowell crosses social and political boarders to spread goodness, truth, and brotherhood through Jazz Music! Sean has had performances with Dave Douglas (trumpet, grammy award winner), Rachael Z (pianist, Wayne Shorter), Reeves Gabrels (guitarist, David Bowie), Tim Lefebvre (bass, Rudder, Saturday Night Live, Chris Botti), Donny McCaslin (sax, Dave Douglas), Anton Fig (drums, David Letterman). He also recorded with Stanley Clarke and George Duke for the movie "Soul Men" starring Bernie Mac and Samuel Jackson and co-wrote the score for the Nick Nolte movie "Off the Black". Sean has also been a motivating force in the New York City jazz community by having hosted weekly jazz composers forums in Manhattan and Brooklyn clubs that consistently showcase the freshest and most cutting edge jazz in the city, as well as collaborating and recording with the next generation of jazz, funk, and avant-garde masters. His first release, "FIREWERKS", was born from these weekly sessions and has garnered critical acclaim for the band's highly interactive and rhythmically adventuresome approach that got him immediately signed as a Posi-Tone Records Recording Artist. Every track on his second release for Posi-Tone Records, "THE SEEKER", is an expression of the fantastic and dangerous experiences collected over the past decade of exploring the less traveled corners of the planet as well as his journey toward self realization and features Dave Eggar on Cello (Evanescence, Michael Brecker, Chris Potter) and Nir Felder on Guitar (Greg Osby). His newest installment for Posi-Tone (to be released in August 2011 at Smalls) came about as a collaboration between NYC (Sean - Tenor Sax, Joe Abba - Drums) and Sweden (Fredrik Olsson - Guitar, Leo Lindberg - Piano, Lars Ekman - Bass). After a 2 week tour, they recorded live at the Glenn Miller Cafe in Stockholm for a very enthusiastic audience. is taking New York audiences by storm with their FX driven jazz/funk that has featured Cliff Almond and Ari Hoenig on drums / Nir Felder, Al Street, Randy Runyon on Guitar / Art Hirahara, Adam Klipple, Walter Fischbacher on keys / Janek Gwizdala, Chris Tarry, Panagiotis Andreou, Evan Marien on electric bass / Krussia - Beatbox / Eternia - MC / Jeremy Pelt on Trumpet. Sean is part of the most creative, forward thinking ensembles in the city including Travis Sullivans Bjorkestra (all Bjork jazz-tronica big band) and performs regularly in the top jazz clubs in New York City including the Blue Note, Smalls, The 55 Bar, The Jazz Standard, BB Kings, Birdland, Cleopatra's Needle, the Knitting Factory, and Zebulon as well as international jazz clubs such as Club JZ (Shanghai), CD Jazz (Beijing), Café Plato (Belgrade) and has played the JVC Jazz Festival, the San Francisco Jazz Festival and for 30,000 people at the Montreal Jazz Festival.